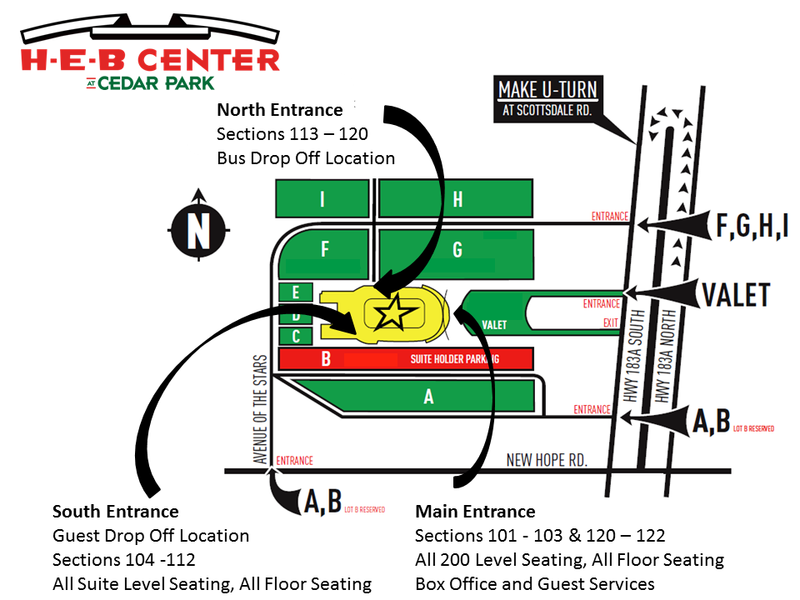 The H-E-B Center at Cedar Park box office is located on the Northeast side of the venue, to the right of the East main entrance doors when facing the building. Sunday (Event Day) Two hours prior to event time. *The Box Office will open two hours prior to ticketed events. For Non-Ticketmaster ticketed events, our box office will not be open unless it is during normal business hours (Monday - Saturday). Tickets purchased in advance may be left at will call at the H-E-B Center Box Office for pick-up. You must have a valid photo ID to pick-up your tickets from will call. For media access to H-E-B Center at Cedar Park events, please submit a working media request. Ticketmaster is the exclusive ticket provider for H-E-B Center at Cedar Park. Tickets for H-E-B Center events can be purchased online at www.ticketmaster.com or by phone at 1-800-745-3000. Accessible/Disabled seating is available on both levels of the arena. Accessible seating is available through www.ticketmaster.com, at the H-E-B Center box office or by calling 512-600-5001. When ordering accessible tickets, it is important to indicate that you require accessible seating so we can properly seat you. Accessible parking spaces are located in Lot B, F, G, and valet on H-E-B Center property. Vehicles legally displaying disabled license plates or window cards are permitted to park in these designated spaces. *Subject to change per tour management. Contact the box office at 512-600-5001 on a show-by-show basis.